The water level is expected to rise 8 feet in the coming days. 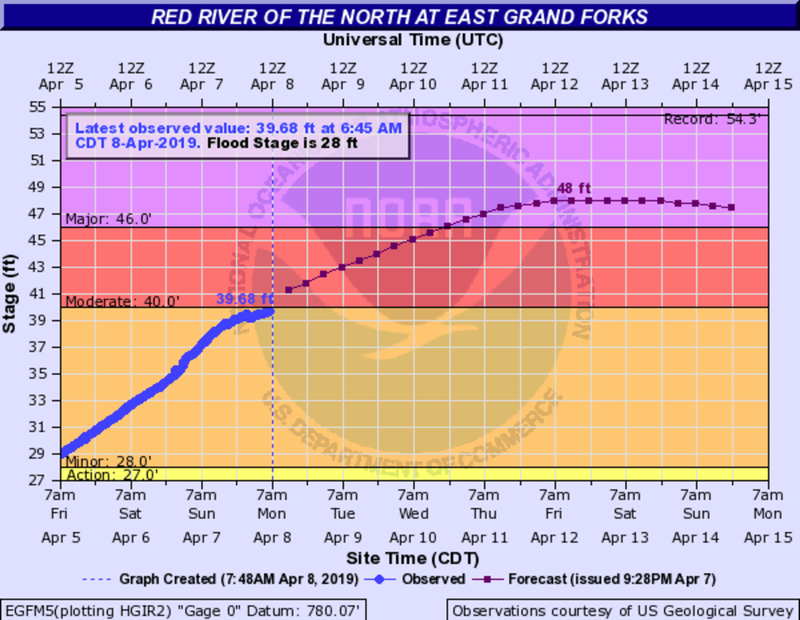 The Red River of the North is expected to rise significantly in the days ahead, and residents of East Grand Forks are preparing. The city will shut down the Sorlie Bridge at Demers Avenue at noon Monday to accommodate floodwall construction, the city announced Sunday. Water levels are at a hair under 40 feet - considered minor flood stage, but serious enough to begin impacting bridges and roads. However, the water is expected to rise significantly. The National Weather Service is projecting the Red River to reach major flood stage (46 feet) by Wednesday night, and reach 48 feet by Friday. Red River of the North at East Grad Forks as of April 8, 2019. If the river exceeds 48 feet, it would mark the sixth-highest crest on record. The highest, 54.35 feet, came in 1997. The Sorlie Bridge is one of main bridges across the Red River and into Grand Forks, North Dakota. The city says Point Bridge is also likely to close soon because of flooding. They&apos;re recommending people use Highway 2/Gateway Drive or the Thompson Bridge south of East Grand Forks to cross. You can see a list of different flood cations taken at different Red River levels here. Yes, flooding in Minnesota in December is a little out of the norm. Police are urging people to stay away. 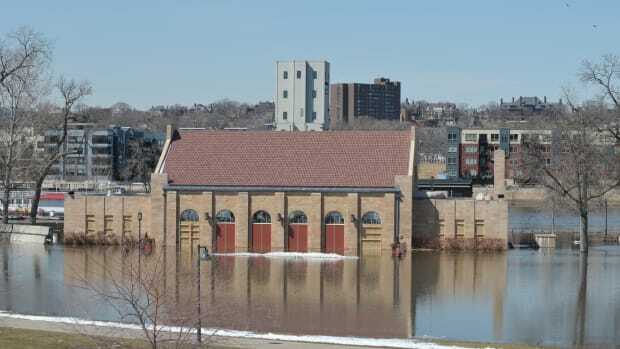 Spring is here and the Red River's not flooding?!? 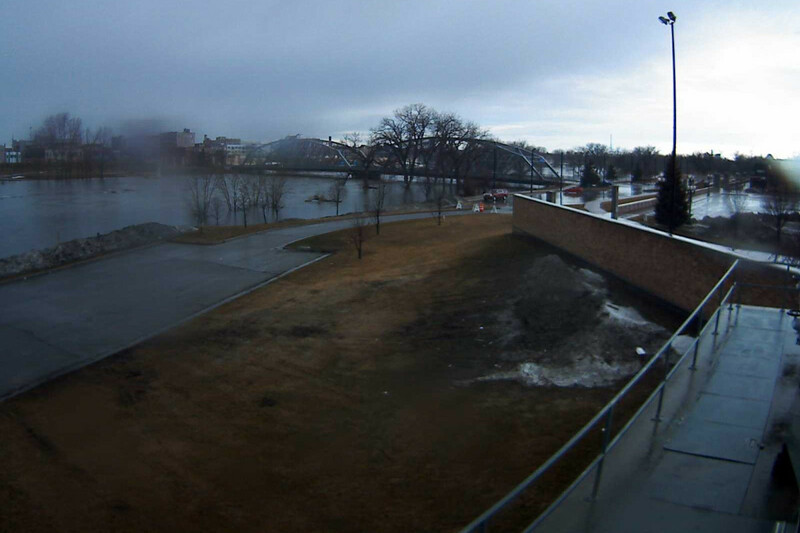 The Weather Service reports the Red River of the North is falling in Grand Forks after Monday's crest just over 17 feet. That's below flood stage and a far cry from the 40 or so feet it reached in each of the last three years. We've had 11 mega-rain events since 1973, eight of them since 2000. Up to six inches of rain could fall in some areas. Flood stage will be reached this weekend, with rises thereafter. Gas up the snowblower if you live in northwest Minnesota.